Bay Haven science teacher Rolf Hanson took a half-acre plot of school property and turned it into a sustainable food forest. Rolf Hanson takes students at Bay Haven into the food forest every couple of months to teach of variety of science and ethics lessons. At Bay Haven School of Basics Plus, learning grows on trees. Literally. 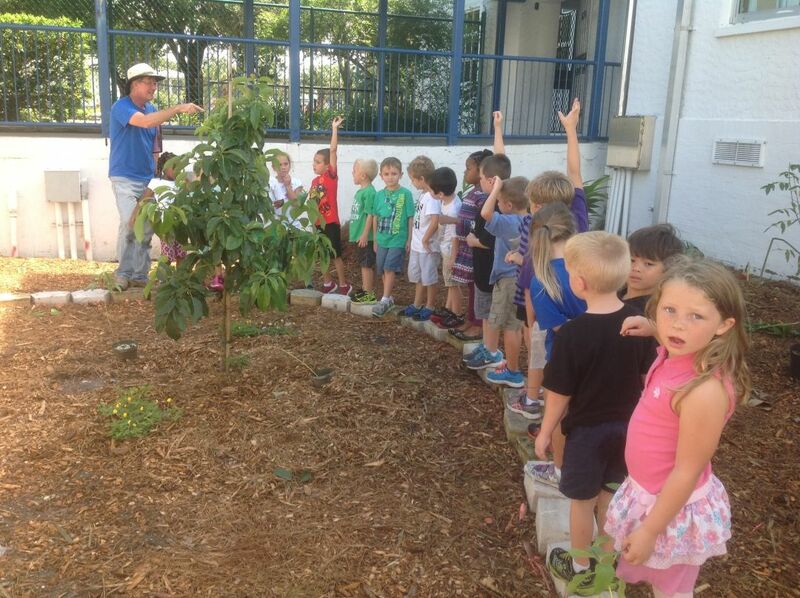 Rolf Hanson, a science teacher at Bay Haven, has spearheaded a sustainable food forest on school grounds over the past three years. The idea is to teach students about food production, ecosystem patterns, plant life and soil composition, all while getting them outside. The food forest lets kids explore and work in a miniature jungle. The food forest differs from a normal garden because the plants produce fruit every year without needing much human labor. Hanson used the principles of permaculture, or self-sustaining food production systems. Because the food forest requires such minimal work, Hanson can maintain it and still teach classroom science. A quick walk through the food forest reveals a wide variety of plants and trees. The lineup includes a peach tree, a papaya tree, banana trees, a mulberry tree, a moringa tree, an avocado tree and a fig tree, just to name a few. One plant produces a berry known as the miracle fruit, which causes sour foods to taste sweet. Its tart-tasting neighbor, a cranberry hibiscus, tastes like chewy sugar after trying a miracle fruit. When Hanson proposed the idea in 2014, he met resistance. The facilities department worried about Hanson trying to simultaneously maintain a garden and teach science; an unattended garden full of weeds was the last thing the department wanted. But after some negotiating, Hanson got the green light to try his idea on a small plot that wasn’t being affected by the construction of a new building. The food forest sits on a half-acre space between two school buildings. The plot used to be a storm water runoff area. A small committee of Hanson, teachers, administrators, employees, parents and community members planned for six months before breaking ground. Hanson then rototilled the grass and planted cover crops over the area, which acted as a natural compost. The cover crops grew over the summer, and in September 2014, more than 70 volunteers worked for six hours on a Saturday to cut the cover crop and lay down woodchip mulch. Volunteers included parents, teachers and even Chad Erickson, the school principal. The mulch was donated by a parent who works as a tree trimmer. After planting the various plants and trees, the food forest was born. 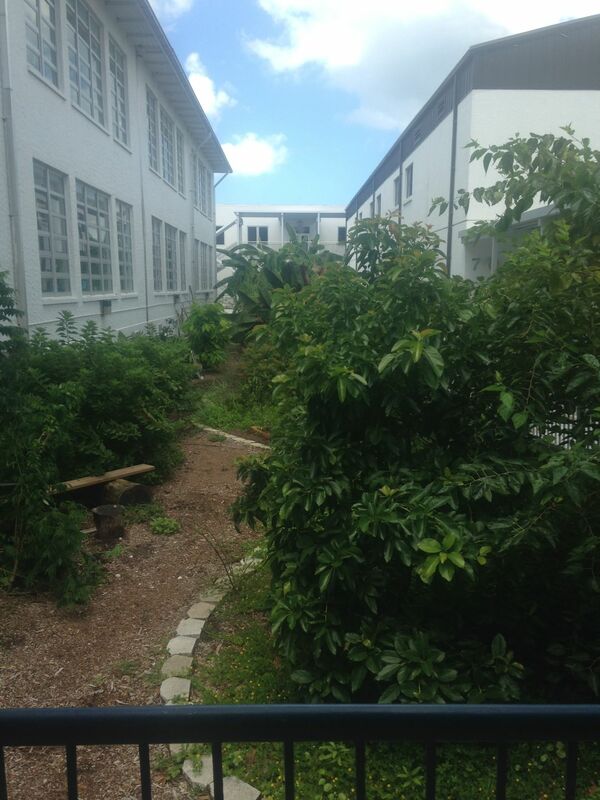 The food forest is located in the middle of Bay Haven's campus in what used to be a storm water drainage area. Teachers, parents, local organizations and students have all done their part to help Hanson turn his vision into reality. The result is a miniature jungle nestled right in the heart of Bay Haven. Exotic trees bearing ripe fruits reach high overhead, and thick bushes line the mulch walkway through the forest. Shovels, trowels, work gloves, plastic pots, wheelbarrows and a compost tumbler sit along one edge of the jungle. These are the tools of the garden club, about eight or 10 students (the size fluctuates) who help Hanson weekly. Hanson teaches science in a normal classroom and sees each class about once a week. He estimates he got out into the food forest with students every couple of months this past year. Permaculture teaches students about science topics like plant biology, ecology and soil. It also teaches students about ethics. The three core principles of permaculture are care for the earth, care for people and fair share. When a group of students took all the ripe mulberries from a tree, leaving none for the other students, Hanson taught each class the importance of fair share. The food forest turns three years old in September. Hanson is now trying to put plants into a nearby courtyard. It will take some more negotiation, but he thinks plants would make the area more pleasant. If the food forest is any indication, he'll be successful.